Posted on May 31, 2009 at 9:31 am in Hindi movies, Vintage Bollywood images	| RSS feed You can skip to the end and leave a reply. Just found out that RK is getting a Lifetime Achievement Award from IIFA whose 10the awards ceremony will be held on June 13, 2009 in Macau. lovely photo. I wonder how you get a ticket to that show, probably you can’t – though Greta, maybe you would be able to if you took that FilmFare of yourself with you. If I go to Macau I’d like to have a focus like this. Ha! I wish! :-) Sigh. V Manohar you have taught me a new word! You yourself write very dithyrambically too. Incredibly handsome and a good actor as well – at times- his diction (dialogue delivery) is really enviable. He was able to play the boy next door so well, he was the kind of a guy girls wanted as a boyfriend, steady and reliable. I think he was at his cutest in Akhri Khat. In fact in one scene his friend talks to his lady friend – I have met him just a couple of times and am charmed by his personality, you have known him for so long, no wonder you are hopelessly in love with him. (Something like that) While this song plays in background – Rut jawan jawan, raat mehraban. Even with Rajesh absent in this scene, you can feel him all over it. My favorite Rajesh film is Aradhna, and my crush on him lasted till Mehboob Ki Mehndi. AFter that my intrest waned. I love this photo of him, very handsome indeed. I’m not very good at picking up diction, but that does seem to be a general consensus on him. I think my favorites are Apna Desh, Roti and Shehzada :) I haven’t been able to find Akhri Khat but will keep trying! Oh, lovely picture! I think this is going to be my favourite Rajesh Khanna photo, having displaced the one that Vandana (Sharmila Tagore) has in Aradhana. He’s gorgeous in that too. I wish he would lose some weight, and get the same hair cut as in this photo, before he gets up on stage to receive his lifetime award. And I hope they get Mumtaz to hand out the award to him!!! I don’t think he has the same hair any more! And ooh yes, Mumu would be a great choice to hand it over to him. Aah, he looked so handsome at this point in time – that is, until that horrid haircut made its unwelcomed way through. I don’t understand how artists could sometimes take the turn for the worst, when the better option is RIGHT IN FRONT OF THEM! Thanks for sharing the photo, Memsaab! He was definitely one great-looking individual – still is, despite the tender signs of aging. He has that rare “charisma” with the image of “goodness and hope”. Was growing up at the time that Rajesh Khanna had just become a superstar. He was everywhere. The first songs I can remember – which I knew every single word of – were from Aradhana. And ALL the songs of the movie !!! That movie was SO popular !!! He just kept them rolling – one after the other. No point in listing the movies, everybody knows them. And then one fine day the bubble burst. I still remember Mehbooba. Hugely hyped. With Hema (#1 heroine) as female lead. Super songs, already out on audio long before the film was released. The movie crashed – and how !!! I think it was the biggest crash in Hindi film cinema till Shaan came on a few years later. Overnight it looked like something was wrong. A Rajesh movie – with Hema – and the public rejecting it ? Movies like Bundal Baaz, Chalta Purza came – and went. What was earlier spoken of in whispers now became more audible. For me, a staunch Rajesh believer, this was not enough to put me off. I needed more evidence that the upstarts Amitabh and Shatrugan were taking over. I was in denial about their hits (and they were indeed beginning to come, a bit uncomfortably for me and Rajesh). The final test for me was “Aashiq Hoon Baharon Ka”. Now, that was possibly the most expensive movie made in that time. Switzerland and all that. Rajesh and Zeenat. It crashed – and the sound (and the reverberations) could be heard across the industry. A crash larger than that of Mehbooba, a crash that was as definitive as it was painful for the (now-yesterday’s) superstar. The verdict was loud and clear. His star tantrums, till then spoken about but endured by all for practical reasons, now became his biggest enemy. Humility had not been his biggest strength anyway – his producers made a beeline for the nouveau populair Amitabh. He struggled to get to terms with the situation. His personal life was also falling apart. His movies were a poor apology for the ones where he had captured the hearts of millions, from first frame to last. I stopped seeing his movies. So, did I let him down in his darkest hour ? Did millions of his fans, like me, let him down when he needed us most ? Was our shunning him the cause or the effect of his demise ? I did pick myself up to see a few of his films later. Avtaar, Thodisi Bewafai and a few others. I thought he did a good job in them. But I had never really liked his acting opposite Poonam Dhillon, Tina Munim and Padmini Kolhapure. And then, worse still, in some South Indian made movies opposite Sridevi and Jayaprada. Spare me ! Or maybe I was just old-fashioned and was wistfully thinking of times opposite Sharmila, Asha and Mumtaz. That is where he belonged. Not with the Tinas of this world. I saw an interview a while ago where he admitted that he had made a lot of mistakes while a superstar. He seemed to have learned a lot, he came across as very humble and sincere. Rajesh has given me many pleasurable moments of film-watching and I do believe he always had his unique style. I wish him a lot of success in the rest of his life. Does anybody out here know the exact and actual order of his movies released from 1969 to 1972.Also which of his movies were box office hits.Most articles everywhere on the web have mentioned the wrong year of release.I would be grateful if you would give me information with releation to my subject of interest. He seems quite a thoughtful person whenever I read current interviews with him. I can’t even imagine (and nor do I want to experience) the furor that surrounded him in his heyday. At least he can always say that he lived a full life head-on! II read about your blog in one of the latest issues of Filmfare magazine this year.Your blog definitely is becoming very popular.However I was dissapointed that you mentioned about the names all your favourites actors,but have not mentioned Rajesh Khanna amongst your favourite movie personalities.It would have had a very strong impact if done by a person of your calibre and popularity. :-) They excerpted from a post I write on how I got started watching Hindi films, and when I wrote it I hadn’t discovered the charms of Rajesh yet. I really look forward to all of them. I’m in my 40s and discovering Bollywood. 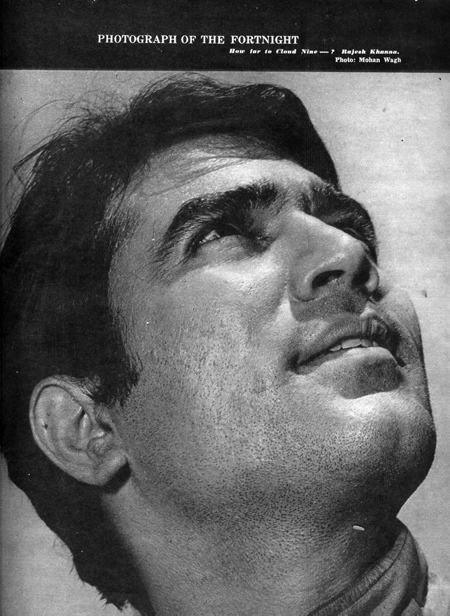 My knees turn weak everytime I see Rajesh Khanna. He can do that to you. I am 28 years used to be a Rajesh Khanna fan right from th age of 17 after watching him in movies like Roti,Sacha Jhoota,Anand and Dushman.I have heard that at the peak of his career his popularity could be compared with my other all time favourite the late megastar Michael Joseph Jackson.Any old articles and interviews actually emphasising on the fact.It would be a real big treat. Does anybody out here know the exact and actual order of all his movies released from 1969 to 1972.Also which of his movies released during this phrase were box office hits. At wikipedia you can get the complete list in order as well as the awards he won. The year of releases mentioned on wikipedia are all wrong.Like the movie Doli Khamoshi and Bandhan are releases of 1970 and not 1969.Anand,Kati Patang,Aan Milo Sajna are releases of 1971,not 1970,etc.Also Dushman,Amar Prem were release in 1972 and not 1971.Likewise Anuraag was release in 1973 and Aaviskar in 1974.I want somebody who has actually seen and noted his success during this phrase to reply.I would be glad if that individual would give me the movies release in 1970 and 1971 alongwith box office fate for the movies Iqtefaq,Doli,Khamoshi Maryada.In and Baawarchi.In some place they are regarded as hit and average runners in in some.Also Devyani Chaubal’s remarks about him having 15 consecutive hits till 1973.So which are those hits. Two different versions of Rajesh Khanna’s career graph.Which one happenes to be right? I would say that reality is somewhere between the two. Memsaab – Am the bearer of sad tidings :-( There has been news since early July that Mr. Khanna was pretty ill. News was just out yesterday that he’s been admitted to the Lilavati Hospital – kidney failure alleged. Oh, no! hubby, who is in Bombay currently, was really hoping to meet Shammi this trip. :-( And he’s also a HUGE Rajesh Khanna fan so RK being hospitalized will be a major shock. I hope both recover. Shammi is on a ventilator, according to Mid Day (and his son)…but seems to be stable. But I think Rajesh has late stage cancer and it doesn’t sound good :( But fingers crossed, for both of them. Hmmm…I don’t think that’s likely. It sounds like he is pretty sick. The Hindi film world is very fickle. It is sad that we don’t treat yesteryears stars with the respect that they deserve. The comments that I wanted to make – Raja Swaminathan has already made them. In an industry where box office successes matter the most, professionalism plays a very important role too. This is perhaps the reason why Amitabh continues to be a success today. Sometimes star tantrums are too much and stars pay the price for that too. But as memsab says if someone has learnt from his mistakes, that is a great thing. All the bloggers, isn’t it sad that such Bollywood personalities fade out only to come back in the limelight on their death. Then we have encomiums written about them when it is too late. Bollywood history is replete with so many examples. Rajesh’s actual name was Jatin and he grew up in a chawl. It is sad that in his career, he had very few opportunities like the one in “Akhri Khat”. What a criminal waste of talent ! The superstar tag did him in as much as his relationship with his heroines. Journalist Devyani Chaubal made some scandalous remarks against him but you don’t know how much of it is speculation. Not having enough work is a perfect recipe for disaster and that is true for these erstwhile Bollywood stars. I am really surprised that Rajesh did not make it to character roles in the last few years. May be he didn’t want to lose his self esteem. But I can’t recollect a single movie of the superstar with Khans or Dutt or Abhishek. Coming to Shatrughan, he really did not make it big like Amitabh mainly because his tantrums were too many. For a shooting at 9 am, he used to report to the sets at 2 pm. Now can you blame anyone else for him not making the mark ? Incidentally, as I was reading about Amitabh’s debut film Saat Hindustani (Nov 1969), I suddenly realized that 1969 was the golden period for Rajesh Khanna. Aradahna was a super hit. Saat Hindustani was a non starter though the concept about liberation of Goa was good. It was more of an art house movie that had the likes of Utpal Dutt, Anwar Ali (actor Mahmood’s brother) and the Malayalam actor Madhu. See the contrast. In 1969, AB was nowhere but just 4 years ahead – we had Zanjeer and then there was no looking back for Amitabh. I hope RK recovers fast and I do hope that his daughters rally around him . I think RK’s family relationships are just fine despite what the rags have consistently maintained. Here are a couple of recent pics with them. 2. This set is from May 2011 with both his daughters, sons-in-law and the two grandchildren. In the 1970s, a course in the Bombay University curriculum, ‘Communication Skills in English’ which included topics of contemporary interest, had a column from the September-October 1971 issue of the journal “Quest,” signed by “D” and titled “The Charisma of Rajesh Khanna”. 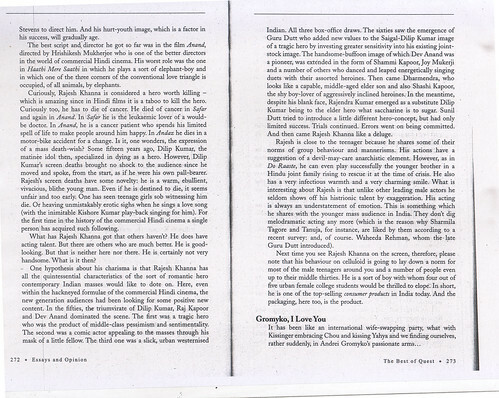 Here’s an excerpt from D’s “The Charisma of Rajesh Khanna”. “It is rumoured that his disarming smile costs Rs. 1.4 million. Young women devour him with hungry eyes in the afternoon darkness of cinema halls. Mothers witness his filmic deaths with helpless pangs of frustrated protectiveness. Young adult males project themselves into his limelit presence on the screen and later yearn to recreate themselves in his image. Millions of Indians queue up for long hours to see him break into his smile, get drunk, become furious, whisper love-words or burst forth into a husky, vibrant played-back song. If there is one person in India today who surpasses the Prime Minister’s charisma, he is Rajesh Khanna. The multimillion rupee Hindi film industry which prolifically produces stereotyped dreams unanimously regards him as the only authentic super-star it has so far produced. He is what makes a sure-fire box-office hit. Even films with all the essential ingredients for making a sure flop have run for weeks just because he starred in them. His success is so phenomenal that it challenges anyone who pretends to understand mass behaviour. The best script and director he got so far was in the film Anand, directed by Hrishikesh Mukherjee who is one of the better directors in the world of commercial Hindi cinema. His worst role was the one in Haathi Mere Saathi in which he plays a sort of elephant-boy and in which one of the three corners of the conventional love triangle is occupied, of all animals, by elephants. For the rest of the piece, go to the link below. Memsaab, Please write a wonderful tribute post on Dear Rajesh Khanna loved by millions for his clean and family oriented films we all loved to see. I woke up to the sad news too. :-( SIGH. Why did I open Facebook this morning and see this news? It has spoiled the rest of the day for me. Rest in peace, Kaka! You will always be missed by me. when i open TV CNN this morning and see this news? It has spoiled the rest of the day for me. Rest in peace, Kaka! You will always be missed for me. be compared with my other all time favourite the late megastar .also kishore kumar of super hit sogns. Thought of all the WONDERFUL times with you (which started because of HIM!) today on this 2nd death anniversary. Listening to some of his songs……some rare ones here. Dear Memsaab :-) Just out, a longish write-up on Kaka in the July 2015 issue of Filmfare, in time for remembering him on July 18th. Introductory excerpt below. That is a great article about him…I feel I know the person he was a little bit better. Thanks for sharing! Rajesh khanna was devastatingly handsome in Amar Prem. He maintains ed his looks almost until the end.